This Glutenfree Glory Bowl is super healthy and super delicious. It’s meatless, gluten-free and jam-packed with goodness. This is a great way of getting your nutrients in. This bowl is packed with healthy veggies like beets, carrots and bok choy and nutrient-dense ingredients like almonds, sesame seeds, brown rice noodles, and apple cider vinegar. This Glutenfree Glory Bowl is inspired by one of the dishes they serve at my favorite beach spot Aloha Beach in Wijk aan Zee. It can be hard to find a delicious, healthy gluten-free meal in the beach bars on the Dutch coast. Most beach places serve fish and chips, burgers or the typical goat’s cheese with honey salad as a healthy vegetarian option. At Aloha Beach they have an awesome menu with lots of healthy and delicious homemade options. They use organic ingredients wherever they can and I love their selection of juices. Aloha beach’s “Glory bowl” is a big hearty bowl filled with brown rice, roasted almonds, red beets. spinach, carrot, sautéed tofu and served with a sesame tamari apple cider vinegar dressing. Wondering about the source of the name, I decided to google ‘Glory bowl’ and found a blog mentioning this is a recipe from a cookbook by The Fresh Tracks Cafe. The Fresh Tracks Cafe is a popular restaurant in a ski resort in Canada with a vibrant menu of savoury and nutritious choices. For years the staff were sworn to secrecy about the menu but they revealed their secret by publishing a cookbook that showcased seventy of their top-selling dishes, their glory bowl being one of them. In this recipe, I took my own spin on the Fresh Tracks Cafe Glory Bowl. Instead of brown rice I used brown rice noodles. I quickly pickled the beet and carrots instead of serving them raw, which adds some zest and freshness to this dish. Instead of spinach, I used thinly sliced baby bok choy. I marinated the tofu with fresh ginger, garlic, chili, tamari and coconut sugar. Then fried them up until nicely browned and crisp. I love the heat of the ginger and chili combined with the more gentle tahini dressing I made for the brown rice noodles. Dress your plate with thinly sliced bok choy. Place the brown noodles with the mixed in pickled red beet and carrot ‘noodles’ on top. 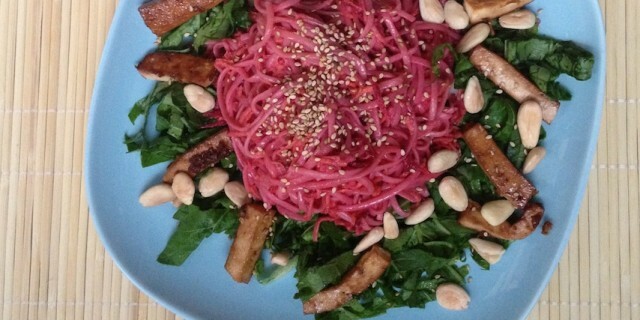 The brown rice noodles become a luscious pink colour by adding in the beets and carrots. Serve with the spicy crispy tofu and roasted almonds and sesame seeds. Feel healthy, be healthy and enjoy! Add the julienned beets into a small bowl and mix in the juice of half a lemon. Cover and set aside to ‘pickle’. Add the julienned carrots into a separate bowl and mix in the apple cider vinegar. Cover and set aside to pickle. You can pickle them for just ten minutes or make them hours or even a day in advance. Cut the tofu in small slices and marinate it for a few hours or overnight in the tofu marinade in a closed container in the fridge. Heat coconut oil in a large nonstick frying pan or wok over medium high heat. Fry the tofu slices with the marinade on each side until brown and crisp. It will take about 6-8 minutes per side. Check them to make sure they don’t burn. In a medium pot, boil water, add sea salt and cook the brown rice noodles. When al dente, rinse with cold water, drain and set aside. In a medium bowl combine the apple cider vinegar, tamari, garlic and tahini. Mix thoroughly and then mix in with the noodles. Serve the noodles on a plate with the thinly sliced bok choy on the bottom, the noodles and spicy tofu slices on top. Garnish with sesame seeds and almonds.